Behind the bus stop on 35th Street and National Avenue, there used to be a patch of littered grass and a crooked line of dull gray and faded blue utility boxes. The corner of 37th Street and Pierce Street was barren except for a bulletin board and a stop sign. After a project three years in the making, new public art installations have been unveiled at the two locations in Silver City. The unveiling, celebrated with a community party on Thursday, marked the completion of a collaborative project between Layton Boulevard West Neighbors (LBWN) and the Silver City Organizational Committee. Community members and project leaders decided art was the best way of attracting people to local businesses, slowing down traffic and building neighborhood identity, said Celia Benton, LBWN economic development manager. After an extensive search and interview process, Lottes and landscape designer Rosheen Styczinski were chosen to work together. “We wanted to have a team that could be sensitive and competent in dealing with the myriad of opportunities and amenities we have in the neighborhood,” Benton said. Most importantly, LBWN and Silver City Organizational Committee wanted the community to be involved in creating the art, and they trusted Lottes and Styczinski to embrace that. Lottes and Styczinski spent months planning and doing research. They interviewed approximately a dozen people to help them create pieces that accurately represented the values and history of Silver City. They reached out to historians, students at the Menomonee Valley Urban Ecology Center, and members of the Latino and Hmong communities. Lottes has been a Silver City resident for 29 years, and she was able to use her own experiences cycling around the Menomonee Valley in her artwork. Benton said she is happy the groups found a local artist and that the community was involved. “We are a really vibrant, smart community here in Silver City, and people just work together incredibly well and that was definitely reflected in this project,” she said. 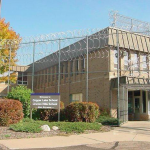 Sponsors of the $40,000 project were the Wisconsin Arts Board, Greater Milwaukee Foundation, Zilber Family Foundation, City of Milwaukee Arts Board and the Neighborhood Improvement Development Corp (NIDC). 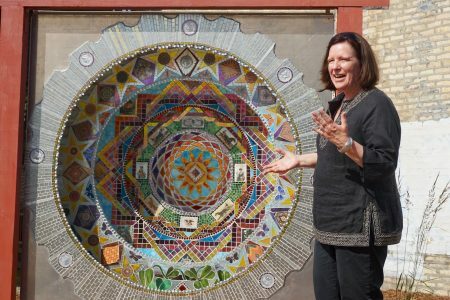 Both artworks are concentric mosaic and stained glass circles, layered three-dimensionally to appear like a “portal.” The design represents how “Silver City is an entry neighborhood to new cultures,” said Styczinski. The “portal” on 35th Street and National Avenue displays the history and culture of the neighborhood, Lottes said. It features images of Falk Brewery and chariot races, and uses Silver City’s colors — purple, gold and red. Silver dollars are also prominent, representing the area’s namesake. Lottes said she wanted to make the artwork symbolic, but easy enough for everyone to understand. Next to the piece on National Avenue are chairs repurposed from old cement sewer pipes, designed as sitting space at the bus stop. “I like to see art integrated into functional elements of something,” Styczinski said. The “portal” on 37th and Pierce streets is made out of recycled drain pipe and glass depicting a waterfall and sun. Depending on the time of day, the piece catches and reflects light differently. With its location near the Hank Aaron State Trail, the Menomonee Valley Urban Ecology Center and Escuela Verde, it represents how Pierce street is an “eco-hub community,” Benton said. Alejandra Gonzalez, a Silver City resident at the unveiling, said the piece on 37th Street is her favorite of the two. Gonzalez added that she hopes to see more art filling empty spaces in her community. 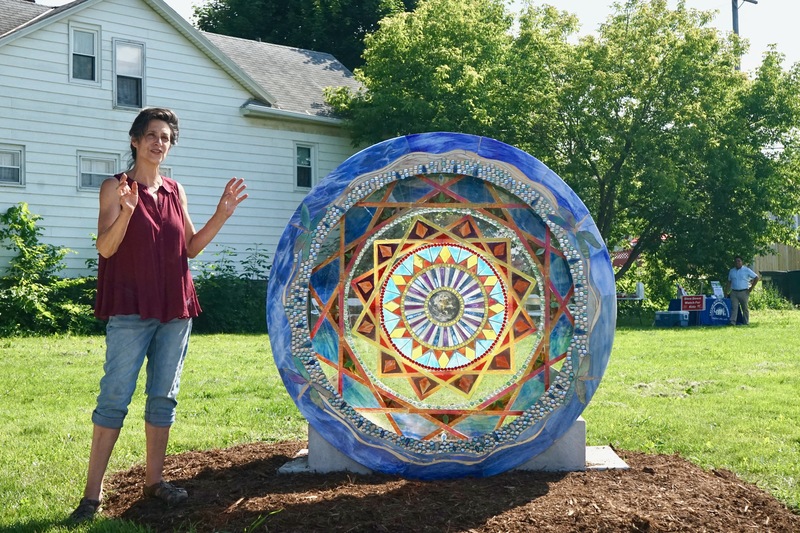 While there are no immediate plans for more art installations in Silver City, Lottes and Styczinski said they would like to expand their work in the future, using an augmented reality app, which would allow people to scan pieces of their artwork to link to information about the area’s amenities and history. The sewer pipe chairs also could be placed in additional locations around the neighborhood. Ultimately, Lottes said she wants her art to pique people’s curiosity in Silver City’s history and the neighborhood itself. My grandpa was a railroad man and often took me to the railroad yards. And 35th and national was on our path. Grandma and Grandpa lived in the neighborhood. I did not know that area was called Silver City . . . and love holding that memory. 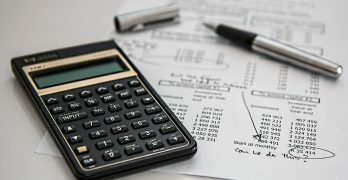 I am an MU grad and think NNS is a great idea! I will be driving over to see the installations!